Trust is the foundation of our connection with others. We learn as children the importance of trust. We look to our parents and guardians to be there when we need them. For all the basics in life including love. As we grow older trust remains an important aspect of our lives. The unfortunate thing is that life isn’t perfect. Some people will break our trust and over time that can make our relationship with trust challenging. It seems that our ability to trust others may stem from our ability to earn the trust of others. And in the business world we know that earning trust is important. Studies find that trust may be one of the most important factors in a business’s success. It’s true in our personal relationships as well. Friends, spouses, etc. It all comes back to trust. Now the question becomes…how do we earn someone’s trust? This is a big one. I guess there’s a reason it’s going first on the list. It drives me nuts when people don’t follow through on a promise. Just this week I have a story. New prospect. We’re ready to get started blogging for them. We always offer up some ideas for posts, but they wanted to come up with the first title. They said they would have it on Friday. I followed up on Monday. They said they would have it by end of day Tuesday. I followed up on Thursday. They said by the end of the day. Now it’s Friday again and still nothing has come through. This can seem like a little thing, but it’s a bad habit that an creep into different areas of our lives. Business and personal. We tell our spouse that we’ll talk with them at a certain time. Then something comes up and we break the promise. We tell friends we’ll meet them for dinner, but then we cancel the morning of. It drives people crazy and slowly chips away at the trust. Those that are careful and realistic with their promises are usually more likely to follow through and more likely to earn respect and trust. We’re not really good at listening. Both are excellent. Very useful, practical information. Which do you think has the most views? The speaking video has 10 times the views and it’s been published for half the time. We love to speak. It’s wired in our brains to talk. It’s a form of reward. But think about your relationships. Who would you go to if you really needed to talk to someone? That person is probably the best listener you know. They listen. They understand. They empathize. And they don’t judge. Improve your listening skills to earn more trust with others. Too often in conversations we jump in with advice and our own stories. And it’s not about always having an answer either. People just want to be heard and understood. Doing that without judgement is the key to winning people over and having them trust you for the long-term. This kind of builds on the last one. When we’re listening to someone we often interrupt. Usually with our own advice or story. It would be okay to jump in quick with a question to make sure you understand what is being said. But sometimes our brains think, “Wait, I know the solution to this…” and we jump in with the aim of helping, but really we make the other person feel like what they’re saying isn’t important. That will make them less likely to trust you. This is the tricky one. I would say that we usually are too quick to jump in to offer help. It seems that most of the time people just want us to listen. But there are times when they do want our help. After the person has gone through their talking period and they ask for your help simply ask them if they are ready for your help? That’ll be a little check for them. If you sense that they don’t really want help them get back to asking questions. But if they do want help then dig in to see how you can help. And you can ask that question. How can I help? Let them tell you what they would like you to do. This is something that great bosses and managers do. They focus on how they can help their team succeed. It’s really the true job description of a boss. Supporting the team. Getting back to #1 on the list. If you do ask them what you can do to help and they tell you…you need to actually do it. If the person is truly a priority in your life then make it a priority to follow through with what you can do for them. The trick here is to be realistic with how and when you can help. It’ll depend on the urgency of the situation. Let’s say a coworker lost their work for a presentation that is tomorrow. Clear your afternoon (unless there are other fires) and help them get prepared. But perhaps it isn’t quite that urgent. Get a block of time marked off on your upcoming schedule and help them in the near future and be clear about when you’ll be there to help. We trust others that give us good referrals. Those that connect us with others and with good situations. When someone we know is hiring they might ask for our thoughts. Connecting them with a good person is a win for everyone involved. 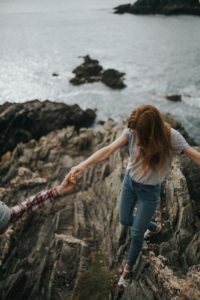 Good for the two people you connect, but also good for you because it bolsters their trust in you. A few of us out there tend to ask for a few too many favors. We may even offer to help someone, but then use that event to earn many favors in return. Favors are a tricky thing. We like to think that when someone helps us that they won’t hold it over our heads. But some people do that and it’s a quick way to break trust. So I guess there are two sides to this one. First, don’t add requirements and reciprocals to the favors you do for others. Second, don’t ask for too many favors from those that already trust you. If you do that trust could be lost. I know a couple that will turn down just about every offer to hangout. Or it at least seems that way. It’s probably not everything, but maybe 7/10. And people remember that. It gets back to being reliable again. Can you count on those people to show up for something important if they can’t even show up for a planned night out for dinner? You don’t have to say yes to everything. The real trick is to say yes by default. But be realistic with what you can do and if you can’t do it explain the reason why. You don’t have to offer too much of an explanation. It probably comes down to priorities. Be open with your priorities. With yourself and with those close to you. People respect priorities as long as they actually know what yours are. Let’s end with a happy one. Just laughing and smiling with people makes them feel good. They know they’re in a safe place. They know they’re not being judged. They know that the world is a good place with good people. They feel loved and cared for and watched out for. It’s amazing how a simple laugh and smile can mean so much. Just not taking life too seriously sometimes feels good. Trust is incredibly important in business and in life. Yet it’s easy to forget that it can be easily tested and broken if we’re not careful. I know that I struggle with it sometimes. I’ve tried the things listed above and they seem to work well to earn the trust of others. I guess the next post would be on keeping that trust once you’ve earned it.